“Knowledge is power. 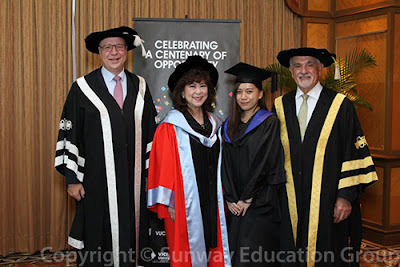 It is also the fuel for the survival of mankind.” These were powerful words from Dr Elizabeth Lee, Senior Executive Director, Sunway University and Sunway Education Group in her Occasional Speech delivered at Victoria University’s 2016 Malaysia Graduation. It was also a speech given to acknowledge the Honorary Doctorate conferred by the University in recognition of her contributions to Education. George Pappas, the Chancellor of Victoria University (VU) commented that Dr Lee had always made VU Melbourne feel they were part of the Sunway family and her personal warmth made them feel welcomed and appreciated. The Graduation was held at the Sunway Resort Hotel and Spa was VU’s largest ever graduation with over 430 graduands – 330 from Sunway Kuala Lumpur and Johor Bahru receiving their Bachelor in Business, and over 100 from other institutions in Kuala Lumpur, Hong Kong and Hanoi receiving their Master in Business Administration or Master in Teaching in English. More than 1000 guests were present. Asides from George Pappas, representing VU were Professor Peter Dawkins, Vice-Chancellor and President; Professor Colin Clark, Dean of College of Business; Teresa Tjia, Academic Registrar and Executive Director, Student Services; and Rhys Williams, Director, International Development. 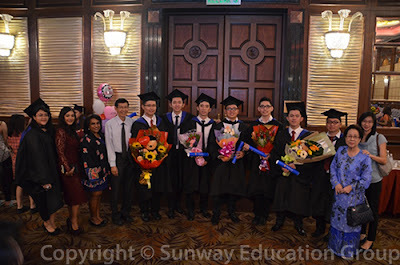 Representing Sunway were Puan Sri Datin Seri Dr Susan Cheah, EXCO member, Sunway Group; Greeja Hemalata De Silva, Head, Australian University Programme; Dr Hendry Ng, Head, Victoria University MBA, and Hor Poh Choo, Principal, Sunway College Johor. Just before the commencement of the ceremony, Teresa Tjia presented a lively session on how the graduands were to comport themselves as they went on stage to receive their scrolls, particularly in the matter of doffing their caps. Tjia’s instructions were very thorough, even gently reminding the ladies on high heels to be especially careful as they stepped down the stage. The Chancellor extended a very warm welcome to the graduands and guests, and he emphasised that a graduation ceremony should be a memorable occasion wherein they should be really enthusiastic with their cheers and claps. 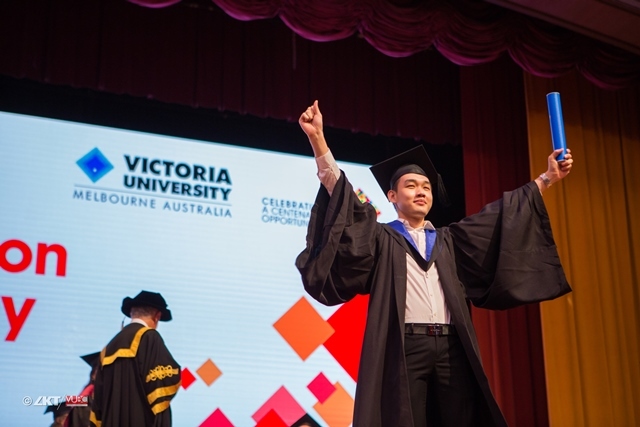 “2016 marks the 100 year anniversary of Victoria University and over 40 years of international partnership.” The Chancellor also said VU College was specially set up as a one-stop centre for international students, and VU would continue to develop new programmes and innovative teaching. The Valedictorian for 2016 was Ong Lee Yan who is her speech said: “Today is the launching point to the next chapter of our lives. Our future is defined not by physical things but by how successful we are as human beings.” This kind of success can be measured by: Our Giving, Our Passion, our Embracing of Differences and by Our Love. In pursuing our passions, we should not be afraid to step out of our comfort zone and to keep exploring. However, whilst we strive to bring out the entrepreneurial spirit in ourselves, we should not forget to “stop and breathe”. In embracing differences, we should not be afraid when we face different principles, opinions and opposition. And finally, whilst we express love for family and friends, we should not feel guilty about taking time out for ourselves, for only by looking after ourselves, are we able to give our best. The ceremony concluded with the reading of the Charge by the Vice-Chancellor, reminding the graduates to use their knowledge and skills for the community, both local and global, and to uphold excellence.